Iron Man is a Marvel Super Heroes set released in April 2012. It consists of an Ultrabuild model of Iron Man. 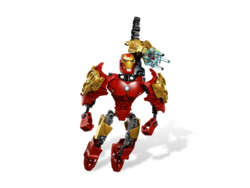 Iron Man is made of a grey and black skeleton, armoured primarily in red, but with some gold. Iron Man's feet are red, as is the armour directly above them. His hips are grey, and are armoured sideways in gold. His torso is armoured in red, with a red chestplate attached below his neck. Attached to the back of his torso is another limb, with a red and gold blaster attached to its end. His arms are armoured in large gold plates with golden decorations on them, and he has red hands. His unique head is red, printed with gold to represent his mask, and blue for his eyes. Tony Stark, known to the world as Iron Man, is seen in this set wearing unique power armour, to help in his fight against evil with the other Avengers. Iron Man's head and printed chestplate are exclusive to this set. This is a description taken from LEGO.com. Please do not modify it. 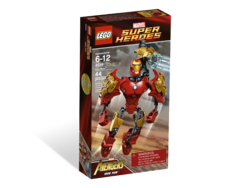 (visit this item's product page) Fight villains with Iron Man's powered up armour and weapons! Iron Man has everything a superhero could need! Powered up armour – check! Repulsor rays – check! Jet boots – check! Shoulder-mounted blaster – check! With this much power, the super villains of the world stand no chance against Iron Man and his band of mighty Avengers! Stands over 7” (18cm) tall! Collect the other mighty Avengers: 4530 Hulk and 4597 Captain America! Facts about "4529 Iron Man"
Fight villains with Iron Man's powered up armour and weapons! This page was last edited on 19 August 2017, at 10:06.